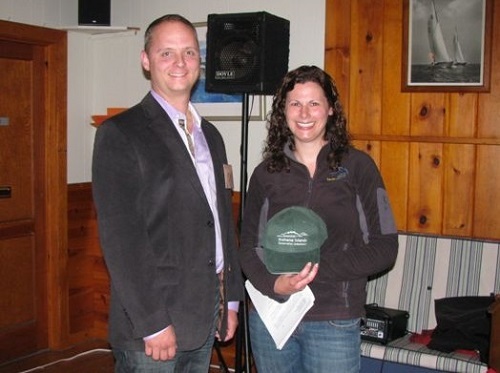 The Annual General Meeting of MICA was held at the Lunenburg Yacht Club on Tuesday June 11 on a cool and damp evening with nearly 50 members in attendance. MICA Chair John Meisner opened the meeting by welcoming everyone. Next secretary Georg Ernst reviewed the minutes from last year's AGM. John then presented the Annual Report of Directors. He started by stating the work of the association continued this past year focused on its Mission. He referred to the current joint acquisition project with the Municipality of the District of Lunenburg for additional lots on Masons Island, as previously announced and that all parties were working to complete this purchase as soon as possible. He noted that on closing, the entire section of land around the big cove (approximately 13 acres) will be protected and available for traditional public use and that MICA's contribution for this acquisition will be $150,000 plus costs. He also noted that "we have been able to make these acquisitions without specific fund raising campaigns because of very generous donations and the successes of the GDAs." John reported that the Gala Dinner and Auction (GDA) has been such an important fundraiser assisting MICA in making these acquisitions and that last year's event, the 10th, set another financial record, having raised approximately $72,000. There were a record number of Corporate Supporters (36) which included 12 first time supporters. John complimented the GDA committee, the corporate sponsorship committee, GDA workers and the artists, donors and attendees who all made this event so successful. John then listed other activities undertaken by MICA and its committees during the year and thanked and recognized the directors who chair various committees, their committees and the executive, all who continue to work so hard for our organization. He also offered a sincere 'thank you' to the spouses and the families of the directors who become involved, either directly or indirectly! John then spoke of the importance of the relationships MICA has with the Municipality of the District of Lunenburg and the Province of Nova Scotia through the Department of Natural Resources (DNR) and that they continued to be strong this past year. He noted that these partnerships have been essential in allowing MICA to take the initiative on acquisitions to date, MICA has privately raised nearly $1,000,000 and, including the commitment on Masons, has contributed about $950,000 to island acquisitions. He summarized these partnered acquisitions as follows: Andrews; Backmans and Covey; Long, Center, Dry and Snipe donation; Masons northern point; Sacrifice; Shag (Indian); and soon to be Masons lots. He reminded the audience that property title is held by our major funding partner and future protection is provided by joint Stewardship Agreements that in essence keep the islands in their natural state in perpetuity and make them available for traditional public use. He stated again MICA's appreciation of these relationships and that the organization continues to work on potential new acquisition projects with our partners. He next spoke about the Stewardship of our islands and stated that MICA's goal is that the island users become the island Stewards and that our motto is 'leave only your footprint'. He reported of the cleanup of Backmans Island last fall and was very disappointed at the amount of garbage left on the popular spots. He asked the group to encourage all island users to follow our motto. He then spoke about MICA membership and that continued success of our organization is dependent upon our membership. He reported that over 1400 people have joined to date and there are approximately 400 regular returning members. He stated the MICA goal is that all those who enjoy the islands in any manner be a MICA member. He asked the group to encourage their friends to join. "Looking ahead, our primary goal continues to be bringing Mahone Bay islands into public ownership for conservation and for traditional public use. There are several other island projects that we are working on and hopefully will make progress in the near future." John reported that, with regret, "We have accepted the resignation of Janice Tanner Ernst from the MICA Board of Directors. We very pleased to report that Janice has offered to continue to work with MICA in a lesser capacity." In closing, John offered a sincere thank you to the board of directors, to committee members, the many other volunteers who have worked so tirelessly and to the attendees. Sherry Swinamer, MICA Treasurer then presented the financial report as prepared by our auditors. On conclusion, John thanked Sherry and complimented her for doing such a great job for the organization. Georg Ernst, Martin Balcome, John Meisner, Syd Dumaresq, Bryan Palfreyman, Sherry Swinamer, Scott Robertson, Gerry Trites. Missing from the photo is Michael Ernst. 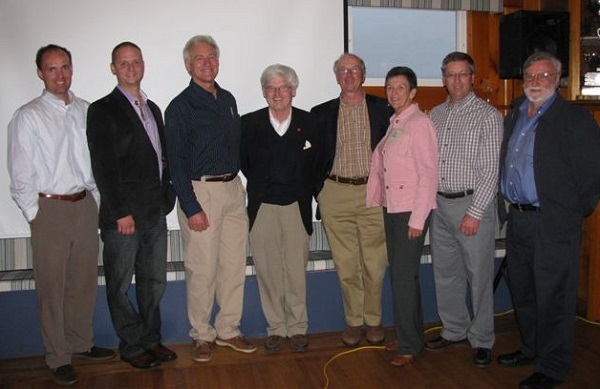 The AGM was then adjourned and Martin Balcome, Chair of the Stewardship Committee introduced Booke Nodding of Bluenose Coastal Action Foundation (BCAF) who presented the very interesting findings of a study on Coastal Erosion on the Mahone Bay islands. Martin noted that MICA initiated this work and financially supported the study which was carried out by Acadia University students under BCAF's supervision. Martin Balcome thanks Brooke Nodding for the talk on coastal erosion with presentation of a MICA hat.